Abu Simbel is the site of two temples; the first and larger of the two is a fascinating temple that hid its architectural riches from modern civilisation until the 01 st of August 1817 . Although the temple was discovered in March 1813 by Johann Ludwig Burchardt, the temple remained closed until the arrival of Giovanni Battista Belzoni. After a whole month of toil Belzoni accompanied by Irby and Mangles (English naval officers) finally removed the sand which had been blocking the temples entrance for centuries. In elation at their achievement they carved their names onto the northern wall of the cella. If you visit the Abu Simbel temple it is worth looking out for the carvings. 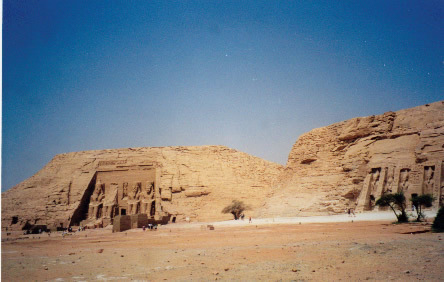 Abu Simbel is situated on the west bank of the Nile , around 850km from Cairo and on the border of the Sudanese Nubia. The temple was built by Ramessess II, who ensured that there would be no doubt that the temple was dedicated to him by covering the façade with four giant statutes of himself. Each of the four seated statutes is, 21m high and rests against a façade which is 30m tall. If you visit the temple today you will find that the face from one of the statues is resting on the ground next to the statutes. The head fell off when the earthquake of 27BC that struck Colossi of Memnon also hit Abu Simbel . Next to the legs of the pharaoh are standing statues of his queen Nefertari, royal princes and princesses. The façade is finished with a sculpture above the entrance of the Egyptian God Re and the upper cornice of the façade has 23 baboon statues. This temple is dedicated to Hathor and Nefertari as Nefertari was the emperor’s favourite wife. The façade to the temple has a series of niches which house statutes of Hathor – Nefertari which are flanked by four statues of Ramessess II. As a symbol of love and admiration for his wife, Ramessess II ignored royal tradition and constructed statues of his wife (the Queen Nefertari) the same size as statues of himself. Above, a photograph of both the temples, standing side by side.